The chanting softly echoed through the hills, all the way from the valley up to top of the hill where we stood. We’ve just woken up and gotten out of our tent in search for the source of this beautiful singing. Our eyes looked down all the way towards the surface of the water glaring up in the morning sun. We couldn’t believe we were able to hear this spectacle unfolding - it felt as if they were just next to us, but really they were at least half a kilometre away, down in the valley. The fishermen were going out to fish in their three-haul-boats as they sung swiftly to the movement of their paddles. The whole bay of Lake Kivu, which we were looking at, was filled with the boats setting off towards open waters. 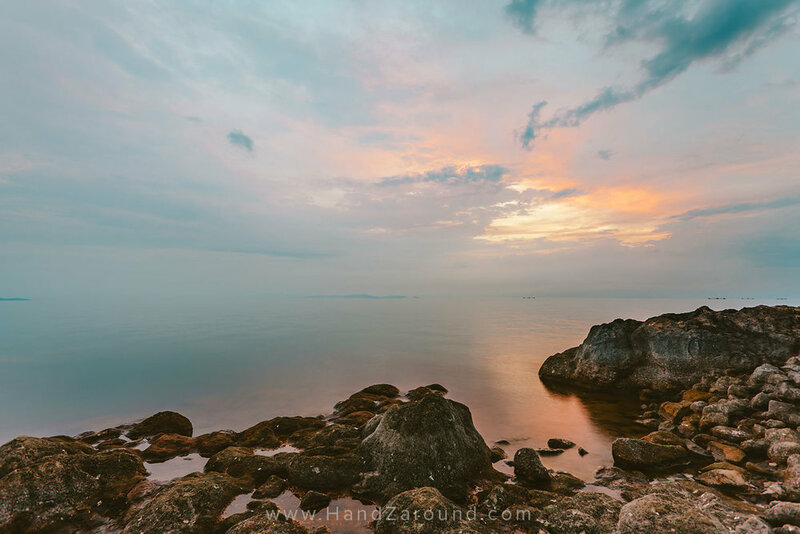 Lake Kivu is a fresh water lake in Western Rwanda on the border of Rwanda and Congo. One of its hubs is Gisenyi, a town bordering with Congo in the North of the lake. Before visiting Rwanda, we have never heard of this picturesque lake, but after hearing a couple of wonderful stories from locals and expats living in Rwanda, we decided we just had to visit it. Gisenyi is a small and quiet town. During our visit, it wasn’t busy at all and we have a feeling it’s not the most famous of Rwanda’s attractions (yep… we know where peeps are gone - everyone's hyped up about looking for gorillas!). 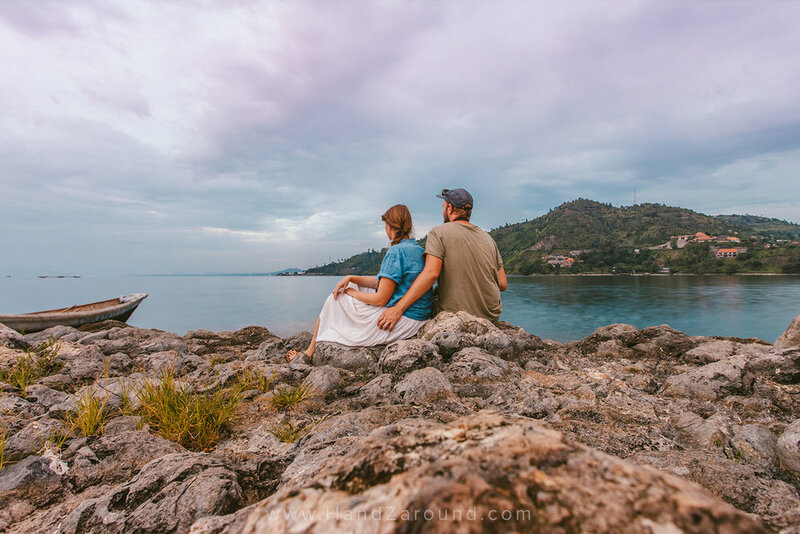 Nonetheless, we absolutely loved it and enjoyed exploring Gisenyi on our own, without anyone hustling us and without herds of tourists on our tail. The North of Lake Kivu & Gisenyi are a great place if you want to get to know the Rwandese way of life, immerse yourself in nature and relax in a peaceful setting. We visited Giseyni and Lake Kivu around the time of our wedding anniversary and we have made some wonderful memories that we will always cherish. It was a perfect spot for us, in terms of budget, uniqueness and picturesquety (does that word even exist?!). We feel that whether you're backpacking Rwanda, staying here long-term or you just came for a short visit from Uganda, and you're after a quiet and genuine experience of local life - this place is for you. Of course we haven’t stayed everywhere in Gisenyi, but we don’t think there is a better place to stay near the lake than Inzu Lodge. Yes, there are some resorts and hotels but they had nowhere near as much character as Inzu Lodge. Inzu Lodge is a tented camp, leaning more towards glamping, than camping (similarly to this amazing glamping place we visited in North of Kenya) - it has real & super comfy beds and the wooden toilet & hot water shower block nearby. Everything is set up in a beautiful garden, which gives you endless opportunities for spotting the most beautiful and the most colourful birds drinking flowers’ nectar. The lodge is set up on a hill which has stunning views of Lake Kivu, and if you wake up early in the morning, you can sit in your deck chairs and watch the fishermen sailing in their huge three-haul-boats. What else would you need from life?! Inzu Lodge is wonderful for anyone who's backpacking Rwanda on a budget, or has a bit more disposable income but prefers to stay close to nature and is after unique stay that won't be found anywhere else in the world. Inzozi Beach Hotel is a restaurant & a hotel with a nice balcony overlooking Lake Kivu - really lovely views at the sunset. Food was very good and priced mid-range. Palm Beach Resort is a really nice spot for breakfast or lunch. The inside of their restaurant is covered with green vines and if you walk down their lawns, you’ll find yourself near the small rock beach. 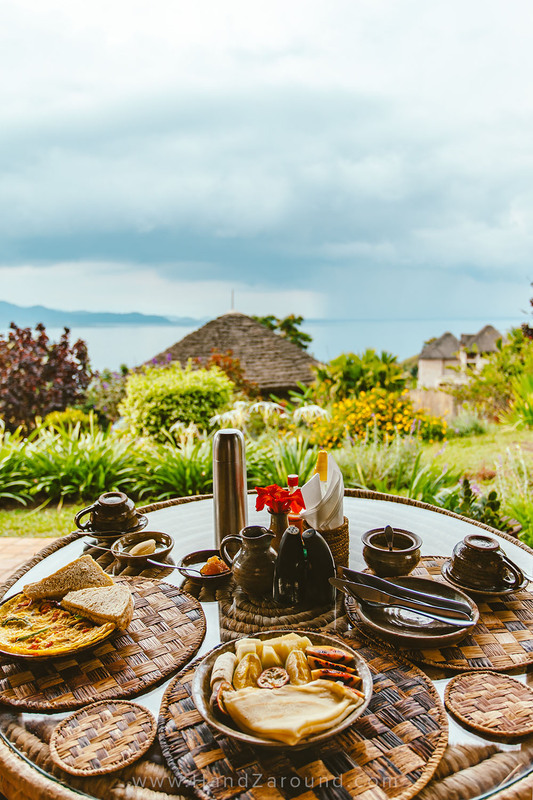 You can sit on the comfy chairs with an umbrella and enjoy your meal with picturesque views of Lake Kivu. Tam Tam Beach is a small joint near Gisenyi Public Beach - we wouldn’t recommend it. We waited ages and eventually after ordering fried chicken, we got a plate of thin bones with almost no meat. The thing we loved most about Inzu Lodge was that they run a variety of day trips and small excursions. 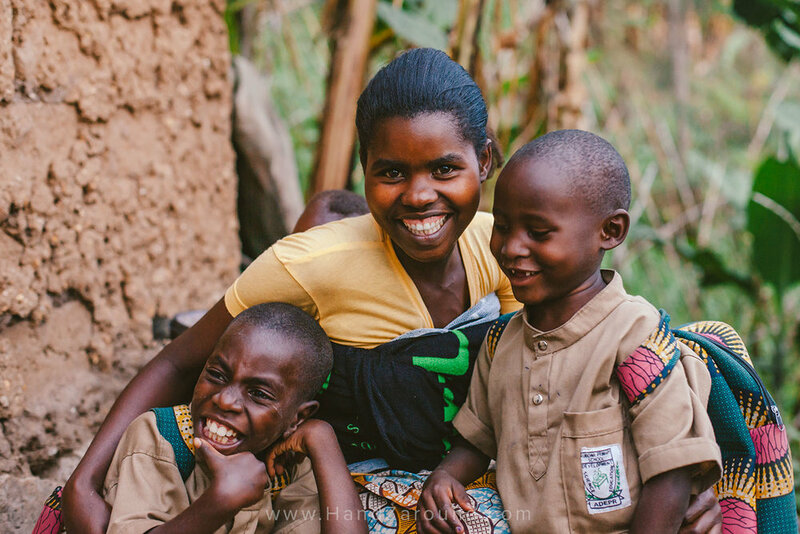 The profit goes to local community and since they are a small business and work with local Rwandese families, whatever you do, you’re taken care of by the loveliest dwellers of Gisenyi. One of our favourite things we did in Rwanda was taking the boat at sunset on Lake Kivu. Inzu Lodge offers a boat ride in a traditional paddling pirogue boat. We got picked up by a local captain who walked us down from Inzu Lodge to a public beach behind the Palm Beach Resort. The captain and an oarsman took us away from the shore towards the blue waters of Lake Kivu and its little rocky islands. The sun was setting down and making the sky glare up in orange and turquoise colours, whilst the fishermen were slowly swimming out from the dock to throw their big nets in hope of a catch. The singing in the distance was becoming louder and louder as the three-haul-boats neared us. The captains of the fishing boats seemed to direct not only the boats, but also the rhythm and tone of singing. The crew would soundly repeat the captain’s verse whilst throwing their paddles into the deep water and pulling them quickly back. In a few minutes we found ourselves nearing the small rocky island. Once we stood on it, we looked away from the shore. With the sun setting on the horizon we felt as if we stood in the middle of the big ocean, which was littered with wooden boats all around us and with Rwandese songs being brought to us by wind from all the sides. Now you know, why it was one of our favourite things we did in Rwanda! We’re usually pretty apprehensive about going on tours to people’s houses - this is something we don’t find genuine and we’ve had experiences which felt as if the family was doing it purely for the money and couldn’t wait for us to go away. On the opposite, when invited to a house as a guest by a genuinely welcoming local family, we would have a great time and nothing would feel forced. So, at the beginning of our travels, we promised to ourselves that we’ll never be going on tours that include visiting a local person’s house or a village as an attraction - it’s their sacred space and definitely not a tourist attraction! When we got to Gisenyi, the Inzu Lodge team told us about things to do in the area. We didn’t even take into consideration having a dinner with local family. However, after chatting to Marie, Inzu Lodge’s owner, we decided to give it a try. Before we tell you what it was like, you should just know that it really was a wonderful experience! Together with a staff member of Inzu Lodge, a friend of the family we were going to visit, we made our way up the vertical hill overlooking Lake Kivu. Cristina, a young lady, living in a house situated a sheer metre away from a big drop, welcomed us with her contagious smile. She, and her little baby Emmanuel, were both very interested in us and the way we live - we had a chance to answer any questions she had and she was happy to tell us more about her way of life. Soon after we got to cooking. Earlier that day she got the produce from a local market and we got our hands on to peeling the potatoes, chopping the onion and getting rid of the tomatoes’ skin. We were sitting outside and the little cookers filled with burning coals were ready to heat up big pots of water. We chatted and cooked, whilst baby Emmanuel crawled around us, interested in all we did. We just made it before the rain - once the food was ready, we hid inside and enjoyed our hot dinner. Soon after we heard the kids voices making their way up the hill - her two boys, who just came back from school, were so thrilled to meet us. They couldn't stop screaming ‘Good morning! How are you? !’ towards us and shaking our hands with enthusiasm. If you want to cook your dinner with Cristina, you can chat to Inzu Lodge and they will organise it for you anytime in the afternoon. Gisenyi Public Beach is not exceptionally stunning but when the weather is nice, it may be nice to chill out on the sand. Swimming is allowed, however there are different opinions about Bilharzia. Bilharzia is a bacteria that supposedly gets into your body if you swim in Lake Kivu - it’s not dangerous but it is advised to buy anti-Bilharzia pills in a local pharmacy and take them as advised on the packet. Some people told us there is no Bilharzia in Lake Kivu, and others that you can only get it if you enter the lake from the shore but not if you jump into the water, since the bacteria lives only near the shore. It does sound funny to us though that everyone has their own different ‘facts’ and we have no idea what to believe in. We didn’t swim in Lake Kivu, although Hanna did dip her feet in the water on the shore at the beach… she hasn’t died yet so we suspect Bilharzia didn’t get her, yay! We didn’t do it but there is an option of taking a ferry from Gisenyi to Kibuye, a city on the lake half way down the lake, or to Cyangugu which is the city on the Southern end of Lake Kivu. We visited Kibuye on another occasion, by car, and similarly to Gisenyi, it seemed like a small quiet city with a several resorts, hotels and restaurants looking out on the water. If you get to Cyangugu though, you will find yourself only 30 minutes drive from the Western part of Nyungwe Forest. It’s a truly magical place which we’ll be writing about soon - it left us mesmerised! Imbabazi used to be an orphanage and it is now home to a kindergarten and a small museum. It’s a beautiful cottage house with vast flower gardens placed in Rwanda’s countryside with a view on the Karisimbi, Mikeno and Nyiragongo volcanoes. It’s about 45min - 1h drive from Inzu Lodge/Gisenyi and you can get there yourself if you’re driving or you can organise a motorbike to take you there. The views on the way are simply stunning and it’s hard to imagine what awaits you at the end of your drive, since you’re driving through areas that feel quite remote. The house used to belong to Rosamund Carr, who after the Rwandan Genocide, opened her doors to the children looking for a home. Nearby you can also visit a Mugongo cave. You can find out what we liked, what we didn’t like and what you can expect at Imbabazi in our post coming soon. We got to Gisenyi by car. We drove about 3,5h West from Kigali. The winding roads were of wonderful quality the whole way and the views of green rolling hills and tea plantations were simply stunning. Our accommodation was provided by Inzu Lodge, but all the other expenses were covered solely by us. As always, all the opinions in this article are our own.